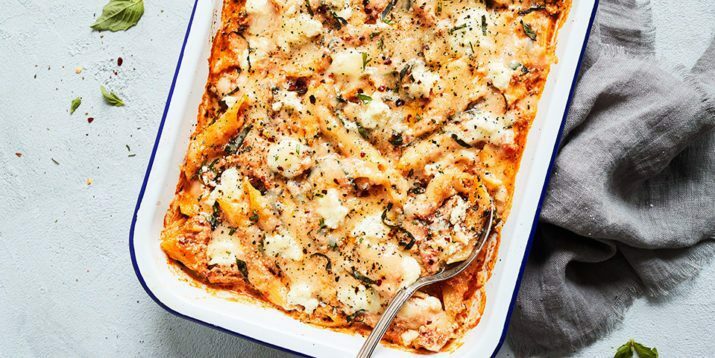 Baked pasta casseroles are the perfect no-fuss dinner for busy weeknights. 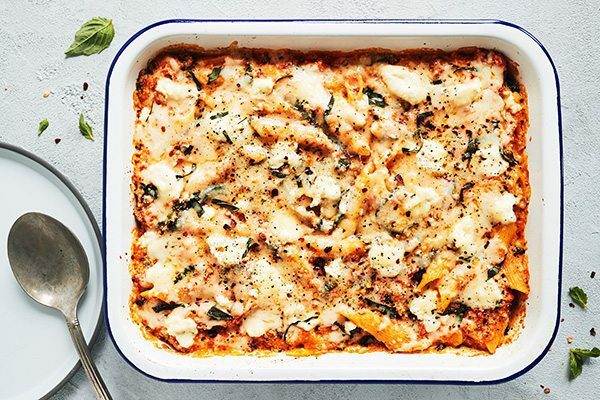 This Baked Ziti with Spinach is loaded with vegetables and fresh herbs, then topped with a combination of three cheeses. The flavors are so delicious that you can sneak in whole-wheat pasta for extra fiber and nutrients without the kids noticing. 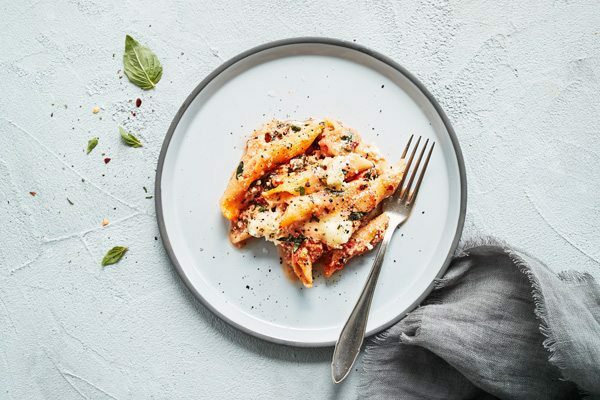 Baked ziti is a classic family favorite, but if you’re cooking for just one or two you can count yourself lucky – you’ll get to enjoy scrumptious leftovers and call them meal prep! 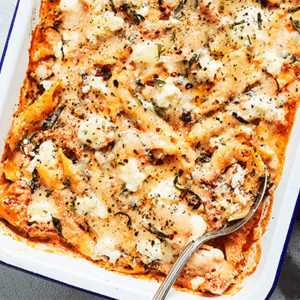 Get creative with this baked ziti recipe by using any variety of vegetables. Chopped kale or broccoli would work instead of spinach. You could choose to omit the fresh basil and use fresh parsley instead. Also, if you’re unable to find dried ziti pasta, penne noodles work just as well (pictured). This recipe can be made in advance so that all you need to do on the night-of is pop the dish in the oven. To do this, prepare all the steps except the final bake. Cover the assembled casserole dish with aluminum foil, and place in the fridge overnight. Then, pop the dish into the oven – removing the aluminum foil at the end so that the cheese can bubble and brown. 1½ cups whole peeled tomatoes (like San Marzano or Cento) crushed or pureed in blender or food processor. Cook pasta according to package directions; drain. Set aside. Add spinach, tomatoes, and basil. Season with salt and pepper; cook, stirring frequently, for 4 to 5 minutes. 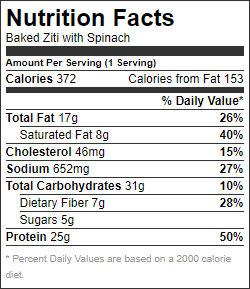 Combine spinach mixture, pasta, red pepper flakes (if desired), ½ cup mozzarella cheese, Parmesan cheese, and ricotta cheese in a large bowl; mix well. Place in a 2½ to 3-quart casserole that is lightly coated with spray. Bake, covered with aluminum foil, for 35 minutes. Remove foil. Top evenly with remaining ¼ cup mozzarella cheese. Bake an additional 10 to 15 minutes, or until cheese is bubbly.